I recently received an e-mail from Joe, a Kickstarter backer, inquiring about the progress of the marquetry rewards. Looking back, I realized that this was the last time I posted on this topic. Much too long without an update! 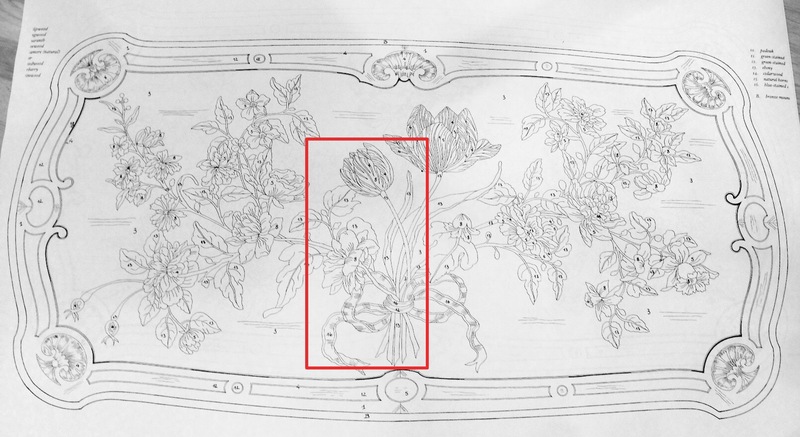 As discussed in that post, the red box in the figure shown below highlights the section I’m considering for the marquetry projects. 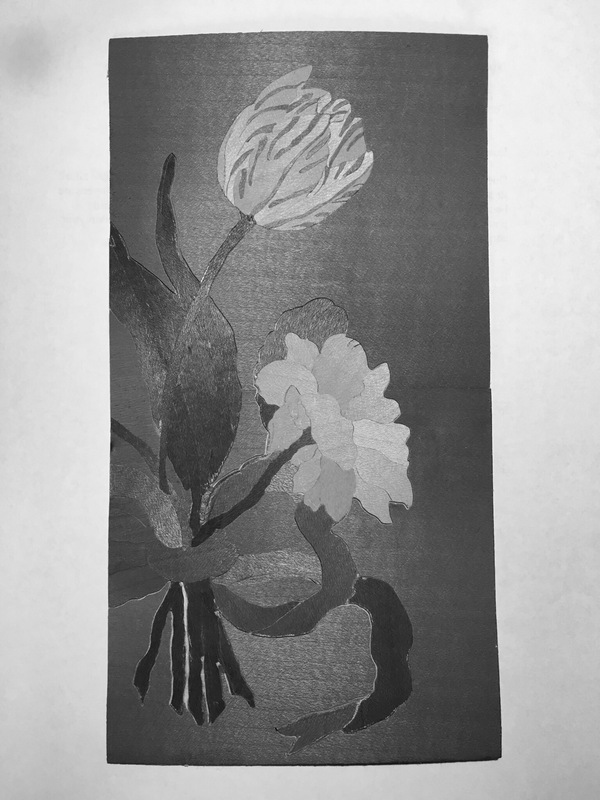 I’m editing it to remove extraneous pieces that won’t make sense in that context, but it will include two flowers and a good portion of the ribbon binding the stems. I used a modified double bevel technique for convenience. 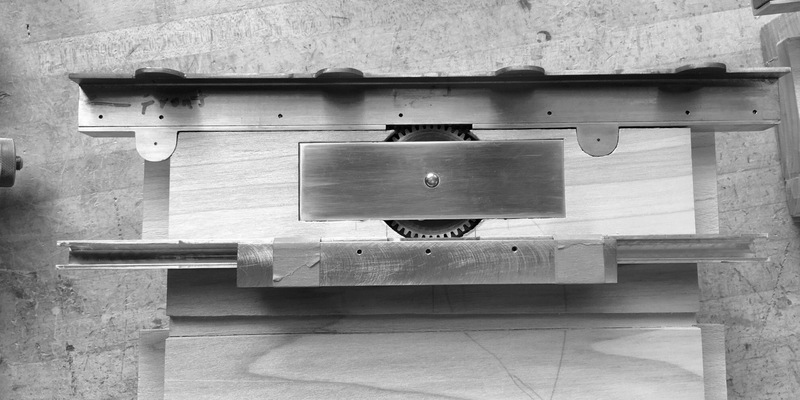 That is, the saw is held at a slight angle with respect to a line perpendicular to the surface of the veneer. This allows the top piece to perfectly conform to the bottom one when the waste is removed. No gaps! Veneer is cut two pieces at a time, each cut adding a new element. Slowly, the artwork takes shape. Sometimes the pieces can become quite small and fragile. With this method, they don’t remain that way for long. They are quickly attached to the assemblage becoming part of the whole. The following image of the upper flower in-process provides a measure of scale. 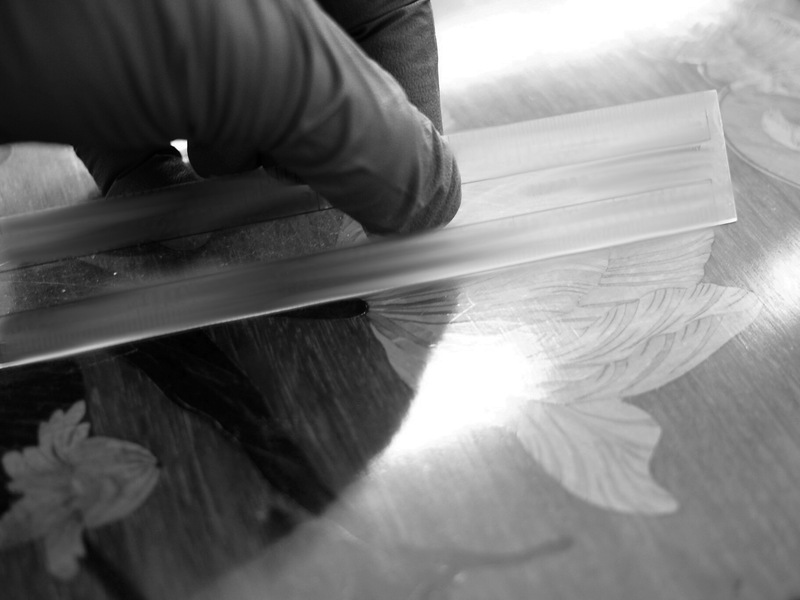 As each flower is completed, it is cut into the background and the picture emerges. Once the piece has been mounted to its core, we’re looking at the back (glue) side in the image below, the binding paper is removed and a sealer applied. 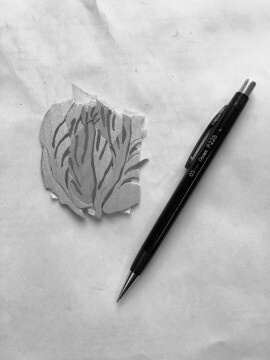 The lower flower can then be “engraved” and the resulting lines filled to add detail. There is still plenty of work to be done before this piece is “finished”. Based on my current schedule, I plan to begin working on the backer marquetry as soon as the prototype is finished. Probably, this summer. 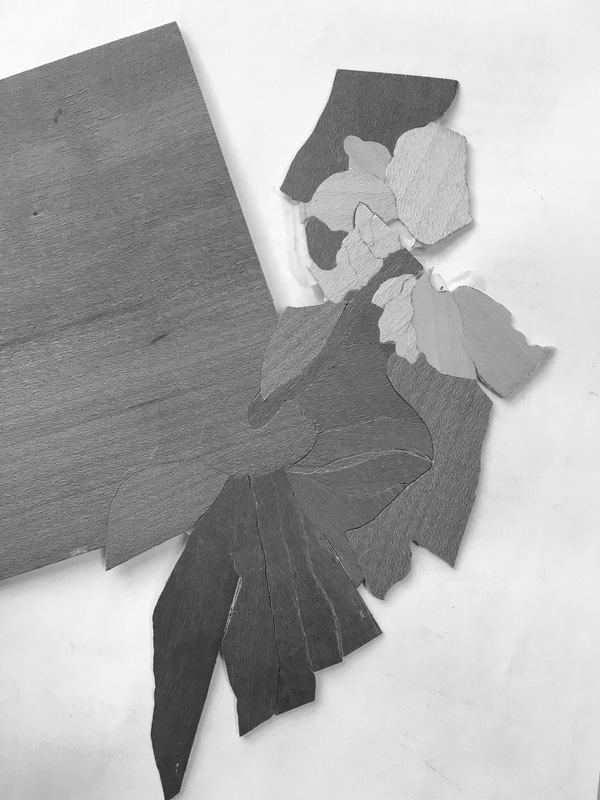 The idea is that by working the marquetry all at once I will become conditioned to its intricacies, my efficiency will increase, and this will put me in good shape to create the final piece for the tabletop. These are fairly sizable components for this piece. Housed within each of the side aprons, they provide the energy to make the table come to life. 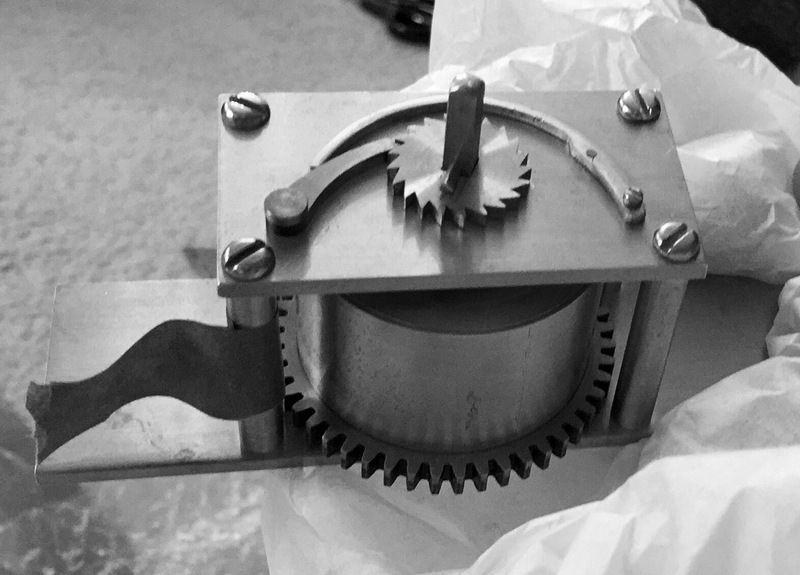 To make this happen the teeth on the large gear must align with those on not one, but two racks placed above and below it. 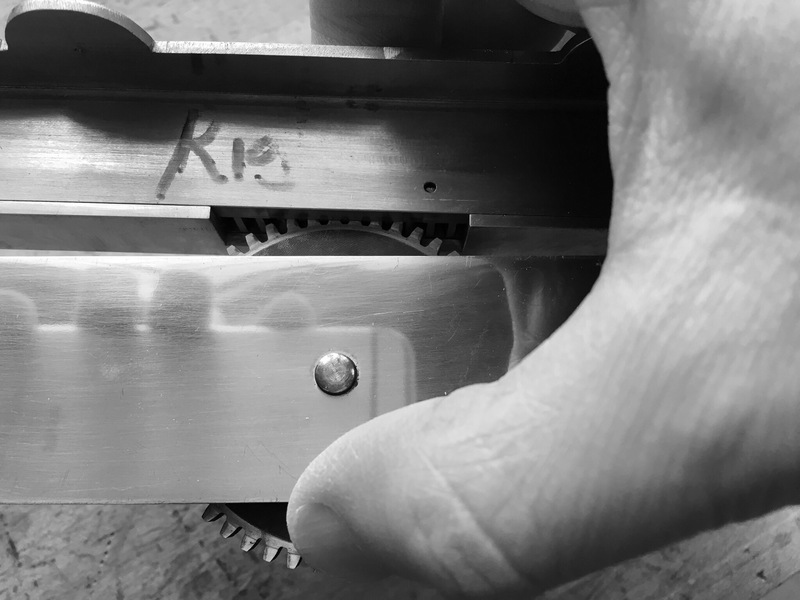 The mortising process is straightforward. A hole slightly larger than the diameter of the large gear is created using an expansive bit which is then excavated to provide space for the rectangular section surrounding it. With the cavity complete, a hole is bored through the apron for the winding axle. The operator will use this shaft to wind the mechanisms. 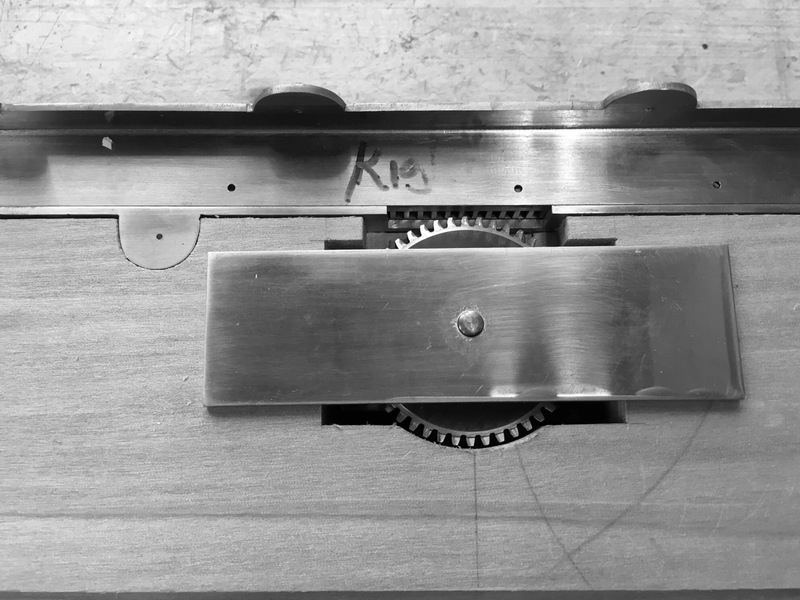 Now the final placement of the drive can occur with the mounting plate mortised into the (interior) apron side. The next step is to mortise for the lower racks, the ones that connect to the main box.